May the spirit of the game always be with you! Spirit of the game circle - After play, both teams get together to celebrate the game and congratulate each other. Have you ever heard of a team sport called Ultimate frisbee? What about spirit of the game? 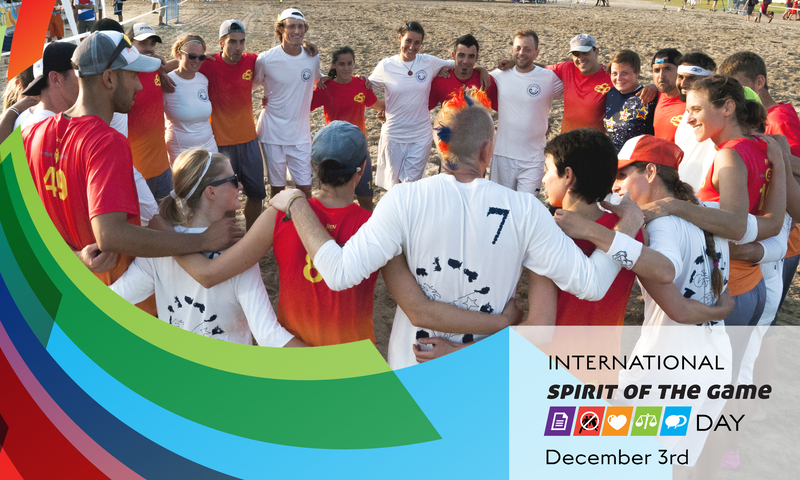 On December 3rd 2017, I am honored to celebrate international spirit of the game day by sharing the five principles of spirit of the game (SOTG) with you. I hope you enjoy… and more than that, I hope international spirit of the game day inspires you to bring SOTG into your day to day actions and interactions. Read on to see how SOTG translates into lessons for life and why our planet would be a better place if we all consistently lived by the principles of spirit. First things first. What is Ultimate frisbee? And what is spirit of the game? Without going into much detail, Ultimate is a highly dynamic team sport played by men and women (and often mixed) in over 75 countries. Games are played on a rectangular grass, sand or indoor field with specific regions at both extremities where goals are scored (end-zones). During each point, a plastic disc is passed between teammates for a score involving a catch in the offensive’s team end-zone. Meanwhile, the defense tries to to gain possession by intercepting the disc and then to score in their own respective end-zone. Ultimate has components from many sports, including rugby, soccer, American football and basketball. However, unlike many other sports, Ultimate has the particularity of being completely self-refereed, even at world championships. When you read that there are no external referees in Ultimate, you may think, “Hmmm, this is not a real sport, just people throwing discs around and having fun”. Well, have a look here and see how highly physically demanding Ultimate can be. In fact, it has plenty of serious athletes, who spend a lot of time and effort to peak for important regional, national and international competitions. And the only way that such high-level play is possible without external refereeing is when everyone involved plays by the first rule of Ultimate, the spirit of the game. Playing with spirit is what allows for there to be healthy competition while maintaining a positive overall feel. Winning or losing, SOTG states that each person has the responsibility to play with maximum respect for their opponents as well as for their teammates. As you will see, the five guiding principles of SOTG can (and should) always be present with us in our day-to-day lives. Out of respect for all involved, a clear knowledge of the rules is essential in any game, and especially where there is no external “policing” to ensure that rules are being adhered to. Knowing and playing by the rules builds trust and allows for quick conflict resolution in situations where altercations do arise. To transpose this into real-life day-to-day situations, it is very frustrating to not have complete clarity of what is expected or needed of us to reach a desired goal (alone or in a group). As is the sense of unfairness and despair that comes from feeling that the rules are changing as we go along. Being clear about the rules is essential for efficiency, security and best performance. If everyone was clear on setting, communicating, and living by the rules, we would be living in a much safer, more economically sustainable, and cleaner world. Since Ultimate is a no contact sport, everyone in the game should actively avoid physical contact. In day-to-day life, this can basically be translated into “avoid hurting others”. However, unintentional and sometimes unavoidable situations do occur in which there is contact during play. In this case, a foul is immediately called by the person fouled. If the person that caused the contact agrees that contact interfered with play, the fouled person is compensated with possession of the disc and the game continues. However, if the person that caused the foul doesn’t agree, they have a chance to explain their point of view and the foul call can be retracted by the one who called it. If no consensus is reached, the foul call is contested and the game rewinds one step before proceeding. All this must occur quickly, so the game can proceed with minimal delay. Back to how this is related to everyday life, there is no doubt that we should all actively avoid hurting others. But sometimes we do accidentally cause damage to someone’s feelings or belongings. In those cases, the ability to recognize and communicate that you have been hurt is important, as is the acknowledgment and request for forgiveness by the perpetrator. On the other hand, if the accused does not agree that damage was caused, acknowledgment and acceptance of “agreeing to disagree” is also valid and important for closure. In either case, actively avoiding hurting others is essential. As is conflict resolution, which allows both parties to learn from the situation and to move on. In Ultimate, pure enjoyment of play is an integral part of SOTG. In life, this translates into having a positive attitude and finding joy. The definition of positive attitude may differ from person to person, but includes practices such as avoiding negative thoughts, not taking things personally, looking at the positive side, enjoying the small things, and being solution oriented… these are all important for a better life alone and in society. As you can imagine, being fair and objective is essential in a competitive sport that relies on the players themselves to officiate their own game. So, and without much need for explanation, is the case in life. Considering that we have a strong emotional side, which tends to take over our perception in especially difficult situations, being fair can be much tougher than it sounds and often requires a significant degree of emotional maturity, the capacity for a beginner’s mind, and developed empathy for others. No one is perfect, and this is a tough one… but we are all a work in progress and fair mindedness is worth investing in personally, at the community as well as global levels. The merits of communicating openly and respectfully need no explanation. We must not forget that communication is about listening as well as talking. Sometimes taking a deep breath is not a bad idea when you feel your nerves on fringe due to the frustration of an injustice or the feeling that you are not being heard. In Ultimate, the saying BE CALM is often used to teach communication skills, translating into Breathe deeply, Explain, Communicate, Ask (someone who witnessed the situation at hand), Listen, and Make the call (act). Communication comes much easier when integrated into the other four parts of SOTG, where all involved are playing by the rules, avoiding hurting others, being fair and keeping a positive mindset. There is no doubt that we humans have fantastic communicative powers on individual, group, and network levels… when we stay objective and don’t spin stories, our communication skills can do much more good than harm. Taken together, the five guiding principles of SOTG in Ultimate frisbee allow for healthy competition as well as timely conflict resolution between opponents. To continue my attempt to transpose these guidelines to our daily lives, I would like to conclude by bringing up the importance of consistency. As always, it is what we do as part of our routines that counts. In sports, this is easy to explain – maintaining a cool head and a positive attitude in a game that you are winning by a lot is much easier than doing so in a close game that you really want to win. It’s the same in life, where principles can be difficult to stick to in murky or stressful situations. No, we are not perfect, but thankfully we do have the capacity of self-analysis and retrospect… and to learn from our mistakes. And SOTG provides five great guidelines to focus on in our journey! others, being positive, being fair, and communicating respectfully. I love the motto, “Play with intensity and always in such a way that you can look in your opponent’s eyes and cheer afterwards.” Think about this and how to incorporate it into your life… and five cheers to spirit of the game! Make random acts of kindness a part of your daily routine – and be happier!